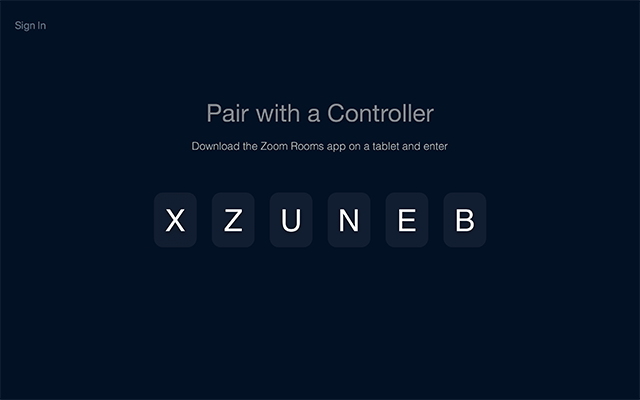 There are 2 ways to add Zoom Rooms; from the web portal or on the Zoom Room Controller. You can quickly add a new Zoom Room from the Zoom Room controller. Setting the room up from the controller allows you to set the room name, a calendar integration, location, and the room passcode. If you need to configure additional options, use the web portal. Install Zoom Rooms Conference Room application on the computer and Zoom Rooms app on the controller device. Open Zoom Rooms on the computer. Open the Zoom Rooms app on the controller. On the controller, tap Sign In. Sign in as an account owner, admin, or user with Zoom Rooms privileges. Tap Create a New Room or Add New Room. Tap the type of calendar you would like to add or tap Set Up Later. If you have previously setup locations on the Zoom Rooms admin portal, you can select a location. Otherwise, this step is automatically skipped. Enter the passcode you would like to set for the room. Learn more about the passcode and when it is used. Your room is now set up and ready for use.